Hi, my name is Jess, and I’m completely addicted to the Lake Apopka Wildlife Drive! Maybe it’s because it’s close to home and not a long drive like most of my other birding sites. Maybe because it’s fun even in cloudy or rainy weather. Maybe because there are tons of great birds there, and I see surprises every time I go. Maybe all of the above. I’m hopelessly addicted! 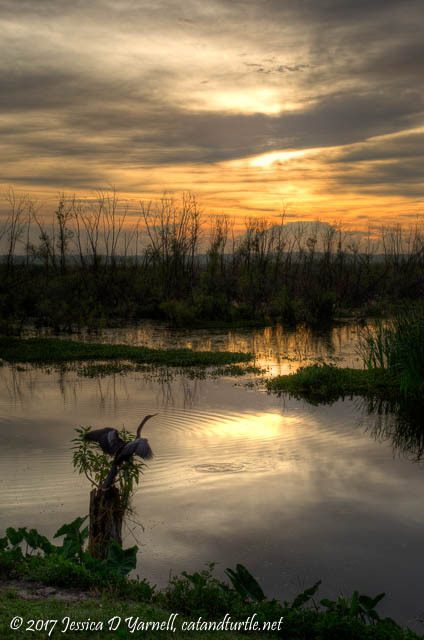 Sunrise at Lake Apopka. Photographed on Welland Road. 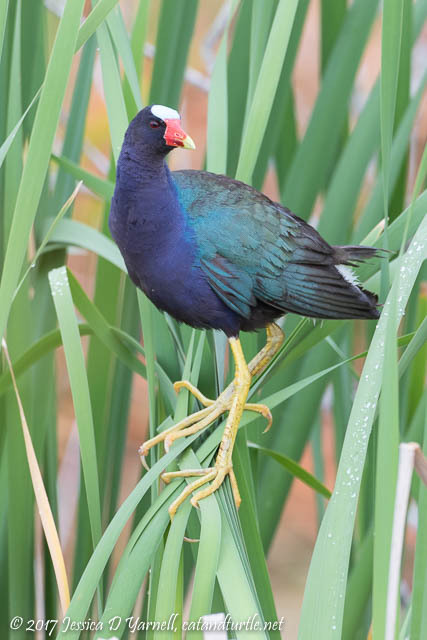 My Purple Gallinule from my previous visit was back out – and he had a friend! 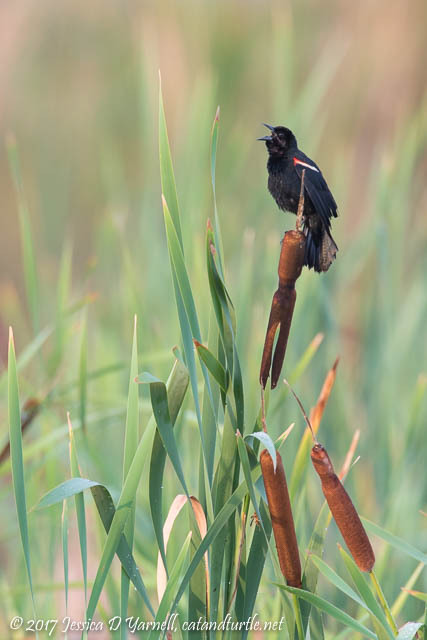 This time he posed for me in some reeds. Such a beautiful bird. I wonder what a Purple Gallinule would say to a male Painted Bunting? 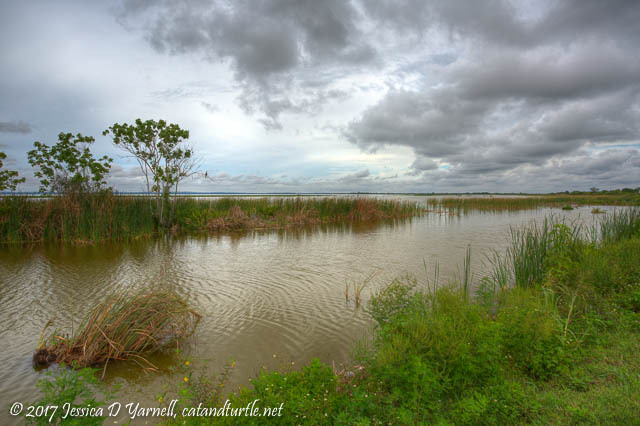 Cloudy, drizzly days at the Lake Apopka Wildlife Drive seem to draw out the Least Bitterns. They are easy to find on any day, but they seem especially brave on cloudy days. It’s such a joy to find them out in the open! At one point I was photographing one Least Bittern, then another TWO flew in! Here are my favorite two bittern shots from this morning. One hopped out onto a branch to catch his breakfast (look closely in his beak to see his fish). Another hopped out in the reeds right next to my car window to give me a head shot! Least Bittern with Fish. Photographed along Welland Road. Least Bittern Head Shot. Photographed along Roach Road. There are Red-winged Blackbird nests all over the place. This one made me chuckle – a double-decker! 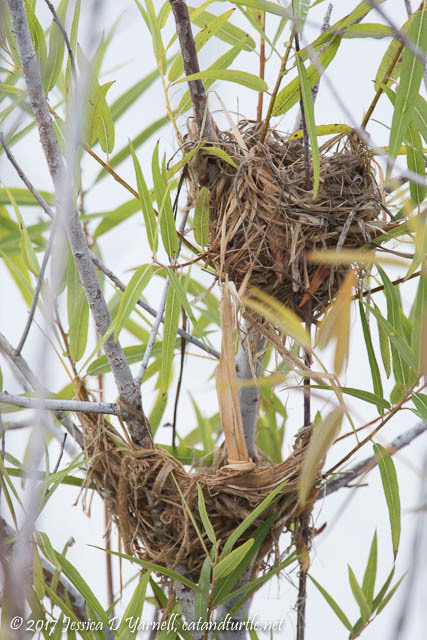 The red-wings aren’t the only empty nesters around Lake Apopka. The bushes are full of juvenile grackles. They seem big enough to look for their own food, yet it’s so much easier to dance and beg for breakfast. Such a fuss! 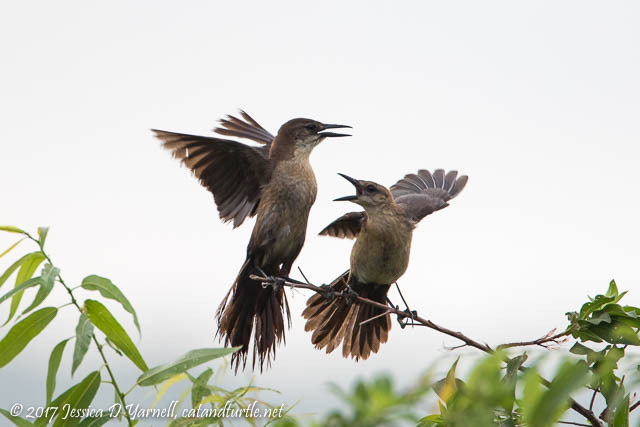 Juvenile Grackles Begging for Breakfast. Photographed along Welland Road. At one point I came across a baby Common Gallinule crossing the road. Mom and Dad were down with his siblings in the water, but he didn’t seem to mind being alone on higher ground. I got out of the car and knelt down to take his picture. In my favorite shot, he seemed to be examining his very long feet. 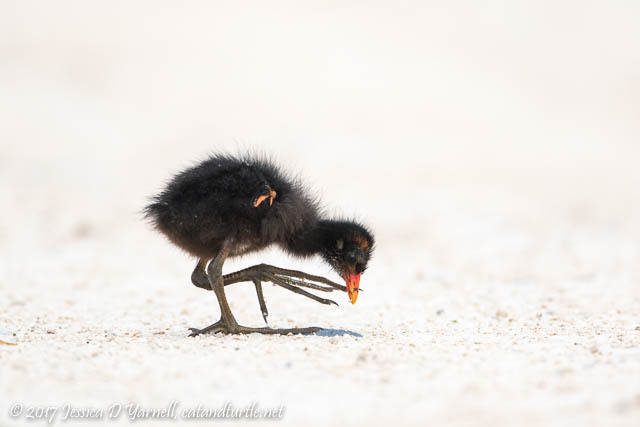 Common Gallinule Baby – Such Big Feet! Photographed along Roach Road. 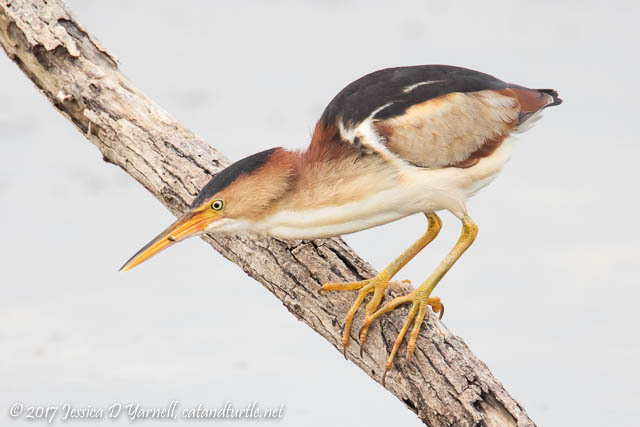 After seeing many Green Herons fly away just as I tried to take their picture, I was starting to wonder if I’d ever get a decent shot. Then I spotted this guy, who had just caught a giant frog for breakfast. The frog put up a good fight but the heron wasn’t letting go of his prey. I’ve heard frog legs are good for breakfast! 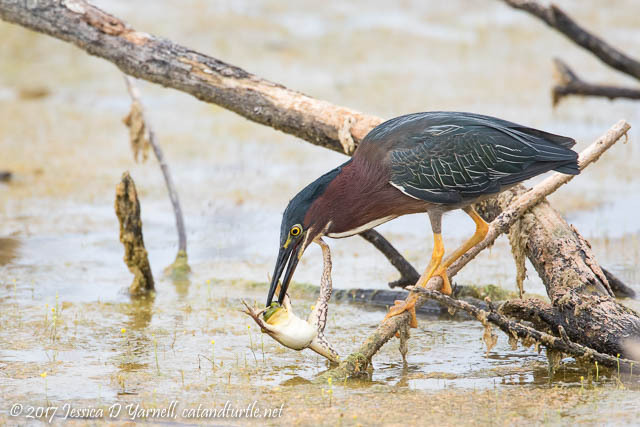 Green Heron with Frog. Photographed along Roach Road. There’s a Tricolored Heron on Laughlin that reminds me of the Reddish Egret “drunken sailor” dance. He throws his wings up and seems to stumble haphazardly around as he casts his shadow in search of a meal. He was challenging to photograph because he was far away and he moved so quickly! 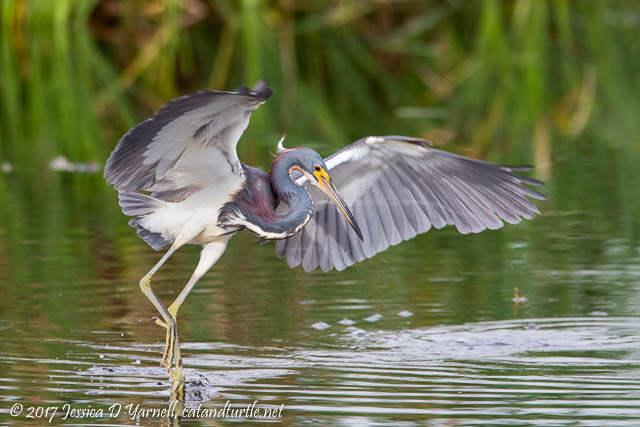 Tricolored Heron Fishing. Photographed on Laughin Road. 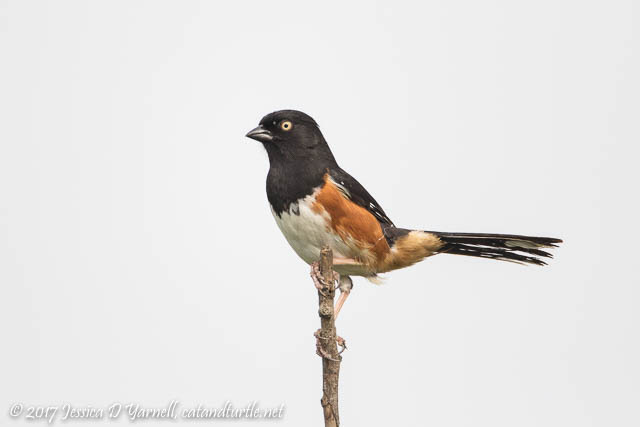 Eastern Towhee. Photographed along Laughlin Road. 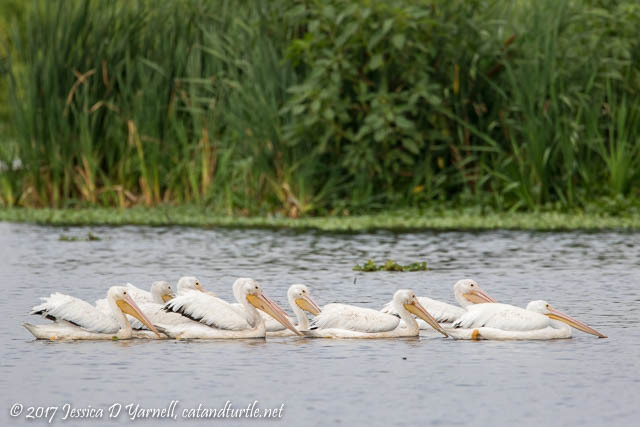 American White Pelicans. Photographed at the Interceptor pond. Speaking of wintertime, this next bird was a little confused about the season, too. 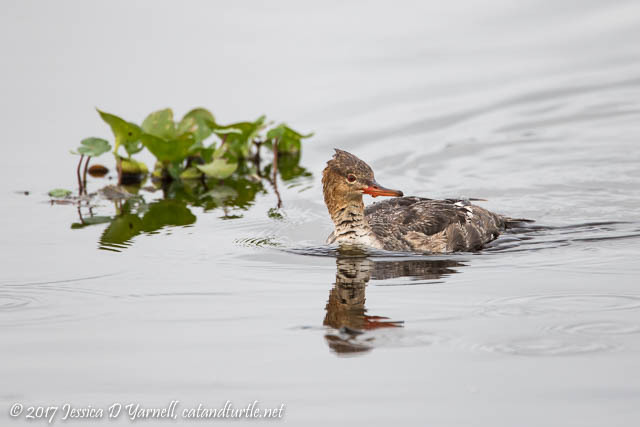 I heard myself saying out loud, “What are you doing here?” This is a female Red-breasted Merganser. She must have been lonely – all her friends left Florida well over a month ago! Red-breasted Merganser. Photographed at the Interceptor pond. Next up was my little Killdeer family. I was happy that it was cloudy, for the even light was better than my previous day with sidelight and heavy spectral highlights from the mud. This was the last time I saw this little family. I hope they found a safe place to grow up. 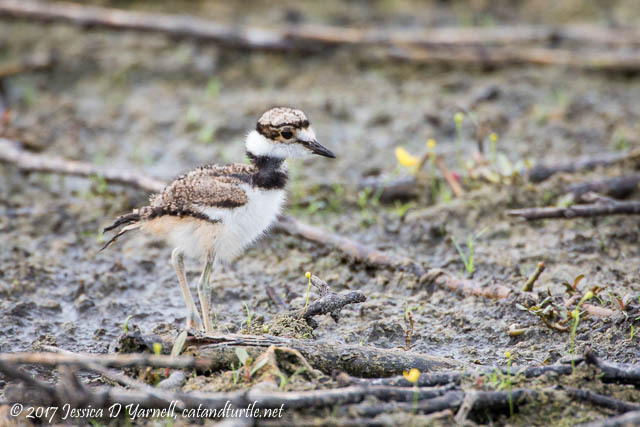 Killdeer Baby. Photographed along Interceptor Road. I spent a few minutes saying hi to Forky, who persisted in staying waaaaay out in the field. It was still early, and I had yet to see any of the Swallow-tailed or Mississippi kites that have been recently reported. So I decided to drive around a second time. There are several alternate trails that I rarely take. One takes you down by the lake shore. It was really pretty down there. The lake shore trail didn’t seem nearly as birdy as the Welland/Roach paths. Maybe it was just getting too late in the morning. I did see juvenile grackles, one of whom showed me the dragonfly that he had caught for breakfast. He promptly swallowed it. 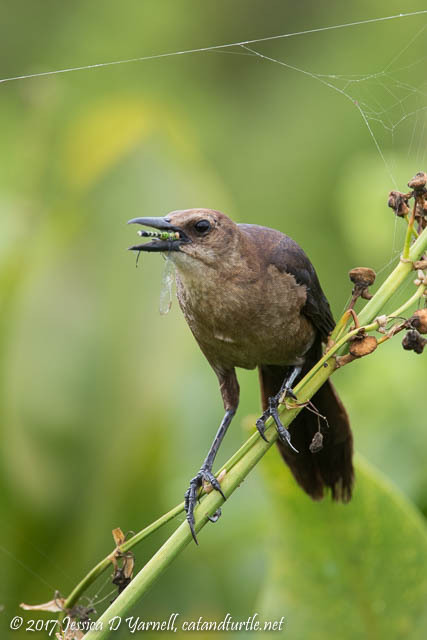 Boat-tailed Grackle Eating Dragonfly. Taken by the lake shore. I didn’t see kites on my second time around. But I did see a few more fun birds, like the Great-crested Flycatcher at the Lust entrance gate, or this little Common Ground Dove who hopped up on a branch to pose along Laughlin. 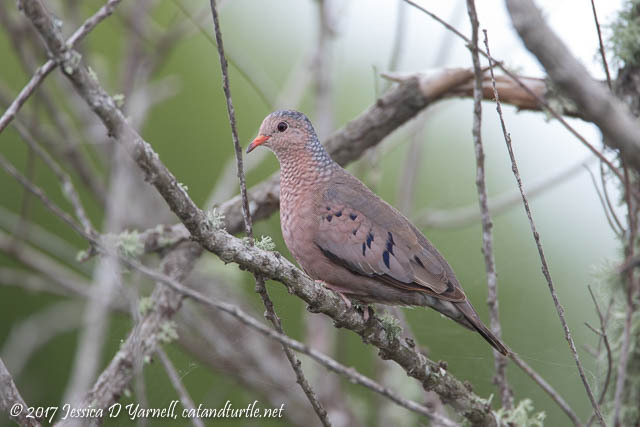 Common Ground Dove. Taken along Laughlin Road. It was such a great morning! 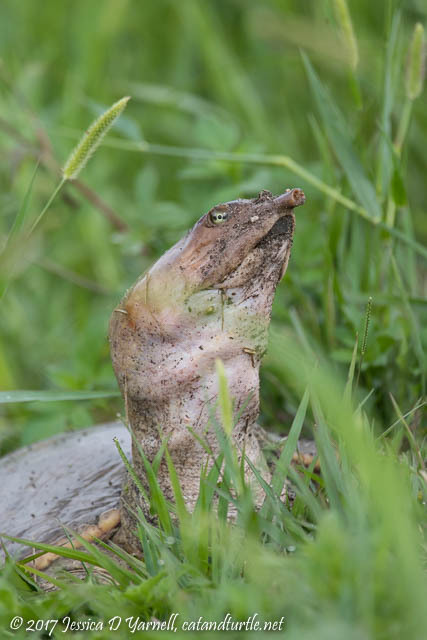 And I saved the best for last – a soft-shelled turtle was about to cross the road. He said to say hi to Rich! 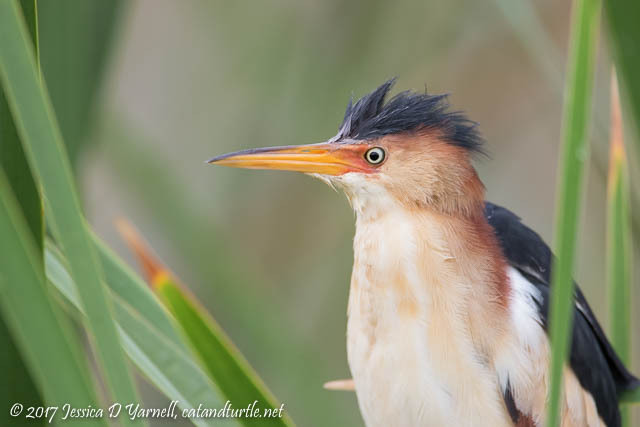 Love the amazing variety of bird sightings you got … I’ve got to get up there one morning! Loved that poor frog trying to resist its fate. All spectacular images, my friend! Fantastic photos, as usual. I especially always enjoy the ones when a bird catches breakfast or lunch. The one with the heron and the frog is especially great. I love the Apopka Wildlife Drive as well! Thanks, Nathalie, maybe I will see you out there one day. Great images and post Jess. Love the frog with his leg extended against the heron’s neck. Fighting until the bitter end. The frog was actually trying to cover the bird’s eye with his foot. He put up a good fight.